Everyone knows that one can search any required images with the support of image option by giving the required name of the image that is available in the Google Home page. But no one does not know that one can search the related images that are available in the net by giving the required model image. Such a facility is provided by GazoPa. Let us assume that in the system there is an excellent Monalisa image. If one, want to search the similar monalisa images that are available in the net then logon to the www. 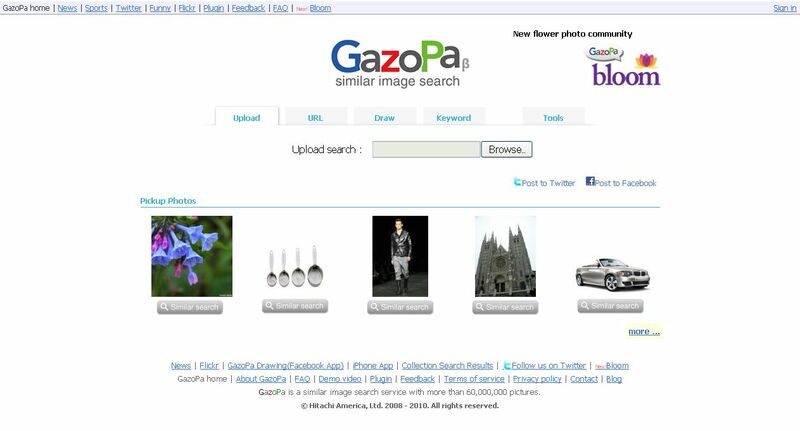 gazopa.com. One can see the options like Upload, URL, Draw, Keyword, and Tool in the homepage. Just search the relevant images by selecting the required image from the system using the Browse option that is available in the Upload. To search for the images that are found in the online select the URL and copy the address those is available in the text box and click the search option. Another excellent feature is that one can draw the required images in the Draw option and can upload the same to the site for searching the relevant images. The keywords can be clicked and search just like as in Google Search.